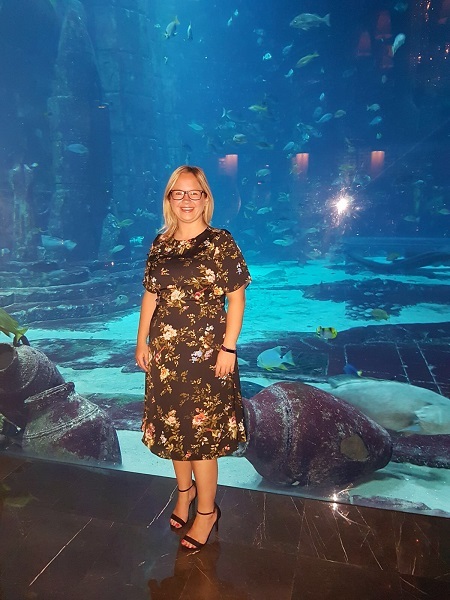 Claire Bradford, Assistant Manager of our Colchester travel agents, had the opportunity to enjoy a luxurious stay in two of Dubai’s best hotels. During her stay, she enjoyed dining at some amazing restaurants and relaxing on the beach. Here is her full report. We met Hollie from Gold Medal and Claire from Qantas at Heathrow and were allowed to check-in at the Business and Premium Economy Desks. It soon became clear why. We had all been upgraded to Business Class for our outbound flight, which excited us all very much. What a treat! After check-in, we made our way to the brand new Qantas Business Class Lounge where a hot breakfast was on offer, along with a cold buffet and complimentary alcoholic and non-alcoholic drinks. I loved the One & Only Royal Mirage. Unfortunately, we didn’t arrive until late in the evening but, on arrival, were shown straight to our rooms. It has a very Arabian feel to it which, for me, is what a hotel in Dubai should be like. The rooms were very well decorated and a lovely size, with a massive bathroom with separate bath and shower. We had a room with a small balcony overlooking the well-kept gardens. We had breakfast the next morning in Olives. Olives is a Mediterranean Restaurant that has indoor and outdoor seating. For breakfast, it offers a buffet with a wide range of delights on offer and this was a fantastic way to start our trip. After breakfast, we made use of the facilities at the Royal Mirage - i.e. the beach. We relaxed for the morning in the sunshine, only being interrupted by the beach attendant bringing ice cold water or asking if we needed our glasses cleaned. The service here is impeccable. 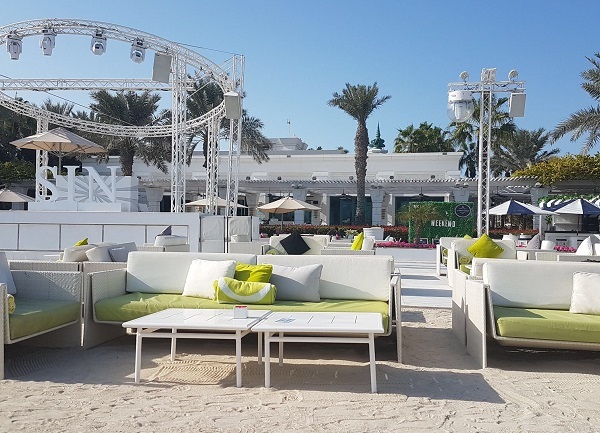 To finish off our short stay at the One & Only Royal Mirage, we had lunch at the Beach Bar and Grill. As the name suggests, it is right on the beach, giving amazing lunchtime views. The food here was fantastic and, again, the service was top class. I was slightly sad to be leaving the Royal Mirage. From the Royal Mirage, we moved to The Atlantis on the Palm via Rolls Royce transfer. We checked-in and were allocated Ocean Deluxe Club Rooms. Ours had a very sizable balcony, a very roomy bathroom and dressing area, as well as a bedroom with two double beds. The décor, for me, was quite basic compared to the One & Only; it didn’t have the same wow factor. We had access to the Club Lounges, so all day there were snacks and drinks available. These cannot be taken away, but the Lounge on the ground floor has a really lovely terrace for those warm sunny days and evenings and the lounge on the 12th floor has an outside area which offers fantastic views of The Palm. You can have afternoon tea here and there is a free Happy Hour between 5pm and 7pm. Of course, we took advantage! The hotel is massive and very American in style and so reminded us of a hotel in Las Vegas. There are many bars and restaurants on offer to suit all tastes, age groups and budgets. The restaurant itself was lovely with a beautiful outside terrace. The food wasn’t my favourite but there was a lot of it. We had lots of different dishes for each course and so treated it more like tapas style. I felt that the restaurant brought out far too much food and I was worried there was a lot of wastage. This is possibly the best steak restaurant in which I’ve ever eaten! They have an open kitchen and the ambience of the place is just perfect. We had mixed starters to share, which were lovely, and then I had a perfectly cooked fillet steak with red wine jus. Then, for dessert, we had a mixture of the signature desserts which, again, were amazing. The staff in this restaurant were extremely friendly and funny; they made us feel very welcome from the minute we walked in. I would not hesitate to recommend this restaurant - it was faultless. This is a restaurant in the waterpark and is perfect for a quick lunch. It is the same as most other fast food places and offers the normal snacks such as chicken, burgers, fish and chips etc. This is a great option for kids and adults on the go. We ate in the buffet restaurants a few times for a mixture of breakfast and lunch. They have a very varied choice of food for both meals and cater for every taste. What a place! We had the pleasure of eating in the best restaurant at the Atlantis. It is underwater and offers a fantastic view of the aquarium. During our meal, we witnessed the engagement of a couple sitting next to the aquarium and a Scuba Diver came down with a sign asking for her hand in marriage. What an absolute honour. Thankfully, she said yes! The food was some of the best I have ever eaten. On the menu were a lobster salad, a fillet steak and a chocolate fondant pudding. This is definitely a place I would recommend for a special occasion. If you want a lunch that isn’t served buffet style, with great beach views, this is the place to go. Again, there is lots to choose from on the menu. This was our last meal at the Atlantis and what a way to finish. Again, we had mixed starters to share and then I shared the shepherd’s pie and the beef wellington with Hollie from Travel2 - both of which were fantastic and had so much flavour. And then again mixed desserts. The restaurant totally lived up to its name. It also has a really nice outside dining garden area which we had the pleasure of sitting in for dinner. Head, Neck and Shoulder Massage at ShuiQi Spa. The spa is large and a very relaxing, quiet and restful place to get away from all the busyness of the hotel. As far as massages go, it was ok. They aren’t really my thing and I don’t really find them relaxing. 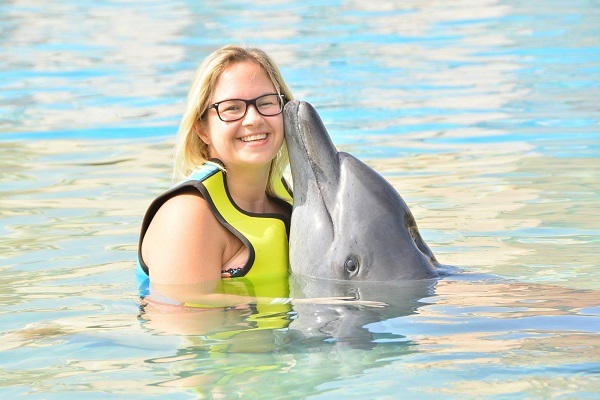 Dolphin Interaction at Dolphin Bay, Aquaventure. Stingray Feeding Experience at Aquaventure. Sea Lion Photo Fun Experience at Sealion Point, Aquaventure. All of the above activities were fun and have provided lasting memories of a fantastic trip. I enjoyed every part of this trip but, for me, eating in the most amazing restaurants has to be a highlight. With a different one every night, the food was very different in each. There was nothing that could have been approved upon. The trip was perfect. I would recommend the Atlantis to families with a healthy budget. They have room types that can accommodate two adults and two children and the facilities are fantastic for children and adults alike. 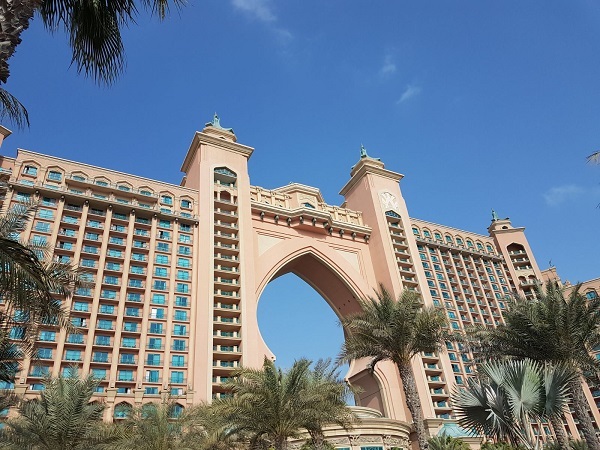 By staying at the Atlantis, you get unlimited access to Aquaventure, as well as the two pools at the hotel. I would recommend the One & Only Mirage to couples and older guests. It had a very quiet and relaxed feel with amazing service and fantastic food. The rooms here were very well decorated, a good size and very comfortable. If you would like our expert team to help you plan your own luxury holiday to Dubai, or a similarly extravagant destination, drop into your local store. We have travel shops in Dorset, Hampshire, Bournemouth and throughout East Anglia.